Iconic Telugu cinema writer, painter and director Bapu passed away a few days ago, leaving Tollywood in a state of despair. 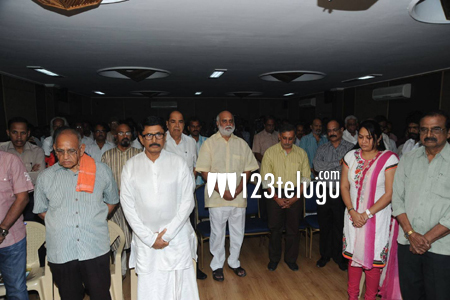 Today, a special condolence meet was held in the Film Chamber building in Hyderabad, as a mark of respect for the departed director. Many leading film personalities attended the meet and shared their experiences about Bapu and his work. The meet turned emotional at times and it was well attended. The last rites for Bapu were performed on Tuesday. The Government of Andhra Pradesh as well as the Film Chamber are planning to honour the memory of Bapu in a big way soon.